The Kingpin is baaacccckkk…This time around, he is intent on giving you the lowdown on the best deals you will get for that carport you need because your garage is really too small to fit in all your ATVs and motorcycles. In fact, you may not have a sheltered place to put them in at all. In that case, you will really want to hear what the Kingpin has to say about these 13 great canopy carports for sale online. Note that these are all from Amazon, but in many cases Amazon does offer the best deals. However, if you like a particular product, it may be available at a lower price (or with a lower shipping price) with other retailers, online or otherwise. You could save a bundle if you’re not too lazy to check. All the Kingpin is doing is pointing you in the right direction, old hoss. While the Kingpin is all about the canopies, you might want to look into a metal carports alternative, especially if you intend it to be a permanent fixture. 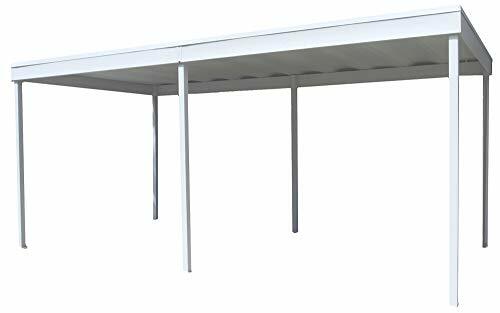 These carport kits are a bit more pricey than the usually canopy carports, but they are quite bit more durable if you have the budget for it. Here are just two permanent carports for sale with which to wet your whistle. The Kingpin is starting you off at the high end of the price point. This is made of powder-coated aluminum and ﻿﻿UV treated polycarbonate roof panels﻿﻿. It comes with gutters but you have to supply the downspout. At 11.7 feet x 12.8 feet, this is big enough to shelter a regular-sized sedan or a small SUV, or a couple of motorcycles. It provides shelter from the wind, rain, hail, and snow but lets the light through. That could be a good thing or a bad thing, depending on your location. You can always through a tarp over the translucent roof panels if you want a sunshade. It takes bit of doing to set this up, and you will need a hammer drill if you have a concrete surface. If you have an asphalt surface, you will need to make an appropriate hole and pour concrete in it for the posts. You can use lag screws or shields to anchor them. This is an easy permanent addition to your home with a multitude of uses, such as an extension of your porch or as a sheltered walkway. Aluminum carports are much lighter than steel carports like the next item, but almost as durable under most circumstances. At first glance, this seems like a more affordable option if you are looking at metal carport kits but the really ridiculous shipping fee ruins the ride for everyone. As the Kingpin pointed out just now, steel is much heavier than aluminum, which could account for the shipping costs. 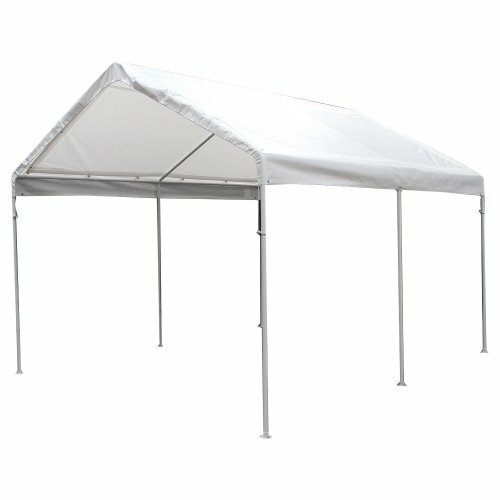 In addition, this is also bigger, big enough for your boat and trailer or as a cover for your patio. This kit is a whopping 1,000 pounds, courtesy of the electro galvanized steel. However, if you want all steel carports, then you might like this one. These metal carports for sale have a 12 year limited warranty against corrosion against heat, sunlight, water, or insects. It is pre-drilled for easy DIY assembly. However, the height of the roof makes it hard to reach to lock the sections into place, and it leaks a bit at the seams. It also does not come with a gutter or anchoring system, so that is something you have to add on your own. It looks functional, and will probably last for several years. These two metal carport canopy products are basically permanent structures and heavy. If you need a portable carport, then an aluminum carport or other metal carport kits may not be your best options. 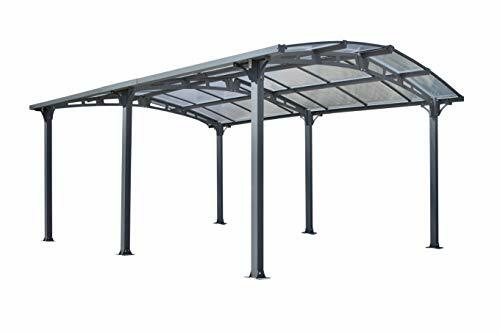 Check out the following suggestions from the Kingpin for carport covers that are more along the lines of a carport tent. If you are on a tight budget, then you need to look closely at the different carport prices. This particular one is definitely something you want to consider. The frame is powder-coated steel with wide foot places for easy anchoring and better stability. 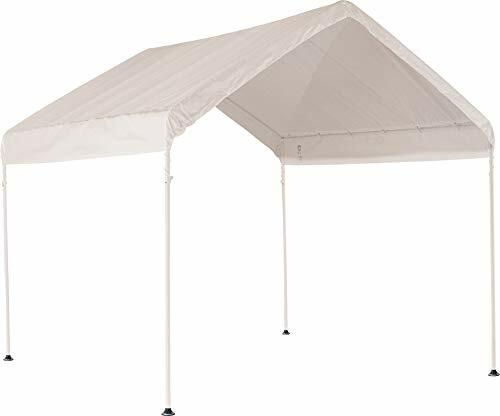 A fitted, valanced waterproof and UV-treated polyethylene cover provides the actual shade, and the whole contraptions is light enough to be used for camping and provide seasonal shade whenever and wherever needed. Assembly is relatively easy with two or more people, but the instructions are not always clear and the lack of a carrying bag makes it hard to transport. It does not come with stakes so you will have to find suitable ones to keep it from blowing away in strong winds. If you are planning to leave this up for a long period, then you might want to replace the bungee cords with heavy-duty zip ties. This product is pretty sturdy considering the price, and needs just a bit of tweaking to make it last a couple of years even in bad weather. However, you have to take the time and make the effort to anchor it very well. This is a fully-enclosed carport, so be ready to take measures to air it properly or you could end up breeding molds on whatever you store in it. 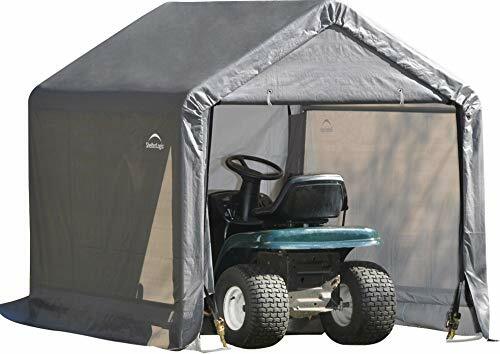 It comes with a roll-up door which can be zipped up when down, which is pretty neat, and the walls are longer then the poles so you can tuck it in under the floor board or bury in the ground to make sure no water or small animals (or even big animals) can get in. The cover and walls are in one piece save for the door, and made of 6 oz. polyethylene. This is pretty thick and durable. 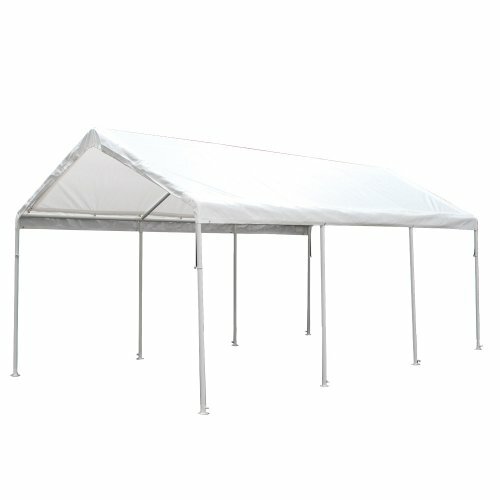 As with most canopy carports, you need to anchor this well to keep it from blowing away. This product does not include the tie-downs, so plan to get those separately. However, the inner width is not 91” (7’ 7” as advertised on Amazon) but about 80” (6’ 8”), nearly a foot narrower than what one would expect. If you need your carport to be wide, then you should consider another product. It is possible for one person to assemble it, but two would be better, and the instructions need to be better organized. You will need to support the frame at reach junction with duct tape for better structural integrity. Overall, a good little carport or shed, or it could be a cool fort for your kids. This carport canopy comes in various sizes. The 6 x 6 feet frame is made of high grade steel. The polyethylene cover is triple-layered to make it waterproof and rip resistant, and treated to keep out UV rays and resist fungal growth. It uses a ratchet tensioning system for easy assembly. Note that you should not overtighten it as it can result in loose thread of the bolts. Thirty-inch anchors need to be used if you want to use is as a permanent fixture,; the 15-inch anchors are not good enough when the wind blows over an extended period. If you just need it for a couple of days, it should be good to go as is. 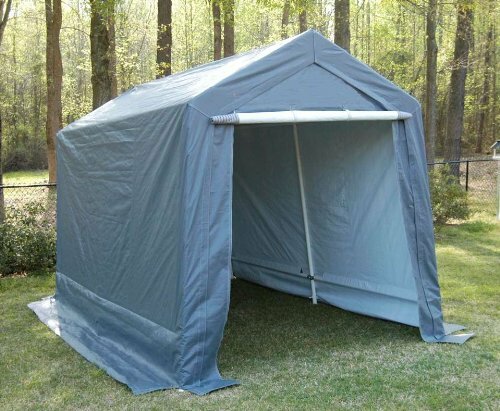 This is also an enclosed shelter, and the door rolls up and secures at the top with the use of bungee cords and the grommeted holes. It traps heat on sunny days, so it should not be used to store heat-sensitive stuff. It also does poor job of keeping dust out, so if you live in a windy area, you still need to protect your gear from the dust. This is a relatively sturdy product, and typically lasts about 18 months before the cover starts degrading. It is possible to replace the cover but it will cost you about the same as buying a new one. You could try finding a generic canopy for it, but in all likelihood you won’t find one that will fit snugly. If you have a vehicle that needs to be protected from the elements or you are planning a cookout and want to make sure nothing mars the festivities, this is a good deal for you. The silver cover sits atop the 6-legged powder-coated frame and it is fairly easy to assemble with two or more people. However, the frame is lacking pre-drilled holes, so you need to use some duct tape to keep the poles from pulling apart. It does not come with anchors, so you need to get those as well. It can withstand reasonably strong winds if it is firmly anchored. This is a smaller version of the product above but uses a drawstring to cinch the fitted cover tight. It is meant for temporary use and does not fare well under the rain. It is primarily a sunshade, and as such it works pretty well. However, it is actually bigger than advertised, so if you are planning to put it in a tight place, you need to know that when assembled it actually measures 13' 4" x 10' 8", and has a height of 9' 8". The anchor pads are made of plastic, which is fine for occasional use, but may not work so well for a permanent engagement. If you do plan to use it as a special occasion type of shade, then you need to plan to have one or two people to help you out because it is too big and heavy for one person to handle. There are also a lot of parts, so it can take a while to set up and break down. Overall, it is durable and worth the price. As the label states, this is a 10 x 27 foot carport canopy with 10 legs with the same powder-coated steel frame and drawstring type cover to keep out UV rays and provide some protection from rain. It is fairly easy to assemble with three or four people to help, and the fabric appears to be sturdy enough. However, it is wider than advertised at 10’ 9” so if you planned a space for a 10-foot wide frame you will have a problem. Another problem is that there is no replacement cover available for this particular model. There are also no pre-drilled holes to secure the poles so it requires a drill or duct tape to keep it sturdy. The feet are wide but made of plastic and they are not attached to the poles, so they also need some reinforcement if you plan to establish it with any permanence. It is not perfect, but a good buy for the price with a little tweaking. This is actually smaller than the previous item and with only 8 legs, but instead of 1 3/8 inch powder-coated steel tubes, it uses 2-inch ones that interlock, which makes the frame more durable. 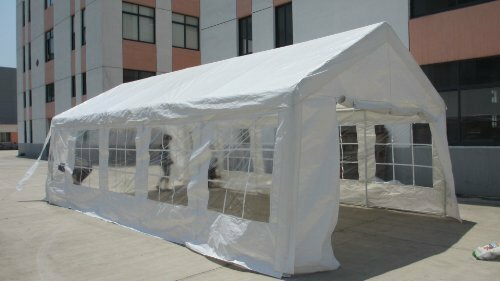 It comes with a waterproof and UV-treated polyethylene canopy that had been heat welded. The cover can be tightened using a ratchet tensioning system for a perfect fit. The foot places are wide for easy anchoring and greater stability. In terms of design and materials, this seems to be the winner in affordable carport canopies. However, the finish on some of the pipes are less than pristine, requiring some filing to make the poles slide in and out smoothly. It comes with pins that are easy to put in once you align the holes, but bolts may be a more secure option if you plan to keep it up for a long time to withstand strong winds. Ground anchors are quite small, so you may want to get better ones. Quality control also missed its footing when shipping the product with missing parts or inadequately glued parts. Once assembled, this is actually a good, sturdy carport canopy that will last for a couple of years. 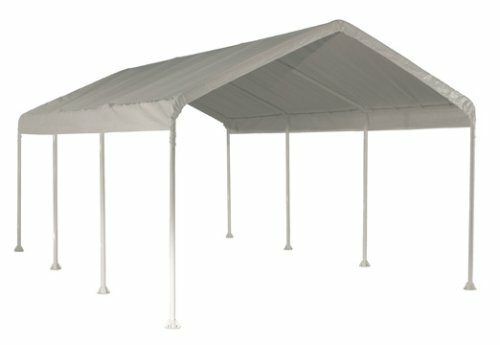 Not to be outdone, King Ca﻿nopy has its own 2-inch diameter steel frame, 10 x 20 offering that is pretty much what its competitor is offering at a slightly higher price. So what’s the difference between the two products? The feet are made of coated metal, so that is an advantage unless you live in an area near the ocean, where the salt water can degrade it. It may be slightly easier to assemble the first side and the canopy as long as there is no wind blowing, with just a little assistance needed to secure the second side. It does need to be firmly secured even for temporary use, so the Kingpin recommends buying the anchor kit at the same time. The kit is pretty heavy, so a wheeled carrying bag would have been nice. At any rate, this is a good contender for this type of carport canopy. The Kingpin thought you might like to check out the other competition, so here is something from Delta Canopies. 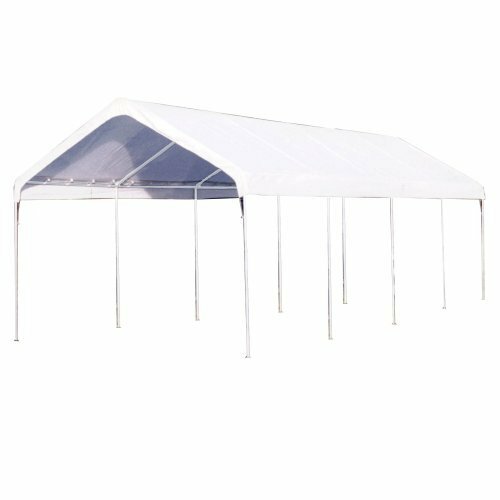 Structure-wise, it is pretty much the same as the 10 x 20 carport canopies from King Canopy and Shelter Logic except that the canopy material is thinner and designed to be used for parties rather than a carport. That does not mean it won’t work as a carport; it only means it has those windows. The manufacturer stresses the need to anchor it properly just as the Kingpin says, so pay attention! It is a solid structure when assembled properly, and will probably last for a while. One caveat: it is nearly impossible to make the pieces fit back into the box once it has been assembled, so prepare a separate container for the small parts to avoid headaches later on. The only difference between this one and the earlier King Canopy carport for sale is that this is fully enclosed and designed to protect against snow. The frame is reasonably sturdy, and the polyethylene cover may give up the ghost before the frame, but it is good enough to do the job. It is important to note that it is not waterproof, however, and the zipper is poor quality. Additionally, you have to buy anchors and tie downs to secure the canopy, as they do not come with the kit. The supplied ball straps were also not enough for all the grommets, but they are also available for purchase. It seems to the Kingpin, however, that these are necessary accessories, and should have been included. It may have meant a slightly higher price, but most people would gladly pay the extra for the convenience. Not very smart of the manufacturer, the Kingpin thinks. 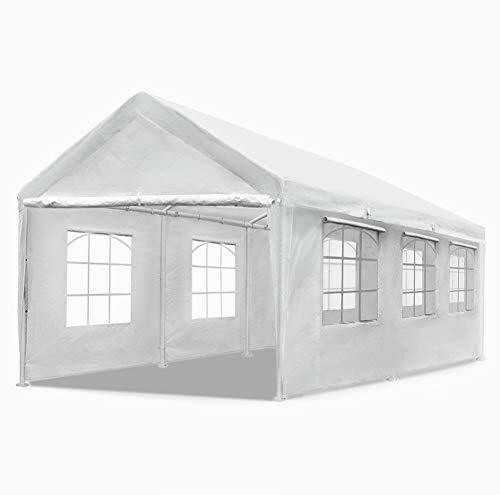 Considering the size, this is not at all a big investment for a canvas carport since it can double as a party tent. At 32’ x 16’, that is 512 square feet of 180g polyethylene shelter over a galvanized steel frame. It has heavy duty zippers and eyelets, and comes with four storage bags for convenience. What is more important, however, is that it comes with the anchor ropes and pegs. That is what the Kingpin likes about this product, and accounts for the slightly higher price tag. However, assembly is not a shoe-in, and the somewhat vague instructions do not help at all. The sidewalls are not waterproof, which is not too big a deal unless it really pours, and then even the seams weep a bit. The problem can easily be solved with a little sealant. Still a good buy, the Kingpin thinks. All the products the Kingpin included in this list are multi-purpose. They are primarily to be used as carports but any port in a storm, right? 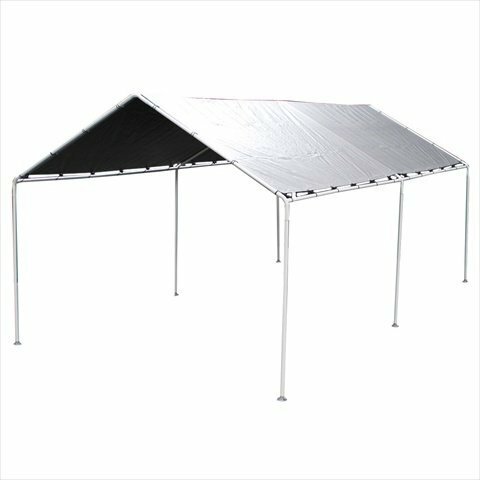 If you need shade for a beach party, barbeque, or a sweet sixteen bash, many of these are good to go. Most of them are portable (kind of) so you can actually rig them to be able to set it up and break it down quickly. It does take a bit of tweaking, but it will pay dividends if you take the time to do it. The important thing is to know what you want it to do for you when shopping around. There is nothing wrong with choosing cheap carports if it serves your purpose. If you really just want your Harley to be safe, then go for the smaller ones. If you need to protect your trailer or camper for months on end, then you might need a metal canopy. Whatever you choose is fine by the Kingpin as long as you keep two things in mind: read the reviews above carefully and always make it a priority to decide how you are going to anchor the fabric-based canopy carports. These covers serve to catch the wind like a kite, and if you do not have the anchoring materials you need when you are assembling your kit, you may as well throw your money away. Or get ready to do as the song says “up, up, and away, on my beautiful balloon”!